In his will Alfred Nobel established a fund to annually award distinguished individuals who by promoting their thoughts, beliefs, creations and innovations, brought out the best in humanity. Nobel established 5 awards, one being for peace. This award should be granted “to the person who shall have done the most or the best work for fraternity between nations, the abolition or reduction of standing armies and for the holding and promotion of peace congresses”. Since 1901 the Nobel Peace Prize has been given 99 times to 106 people and 27 organisations. Some of the most notable political persons to have been awarded the Nobel Peace Prize, include Woodrow Wilson (1919), Martin Luther king (1964), Adolfo Perez Esquivel (1980), Nelson Mandela (1993), Jimmy Carter (2002) and Barack Obama (2009). All these men undertook necessary efforts to secure peace worldwide while praising solidarity, hope and perseverance for a better world. Luiz Inácio Lula da Silva has been named as a candidate for the 2019 Nobel Peace Prize by Adolfo Perez Esquivel, who received the prize in 1980. Esquivel a Human Rights and Non-violent protest activist has become known for his contributions towards fighting human rights abuse, including assassinations, tortures and disappearances-all of which took place during Latin American dictatorships. Perez Esquivel’s campaign to nominate Lula has amassed close to 500,000 signatures. These numbers are no surprise to us if we remember that Lula transformed the lives of thousands of Brazilians and became a political symbol of hope for peace and social development. Though the reasons that make Lula an ideal candidate for the award are numerous, we will highlight here some that gave him worldwide acclamation. Firstly we can mention Lula’s contribution towards fighting hunger and poverty, a plight experienced by thousands in Brazil. Lula himself has suffered it. Secondly, we can mention his contribution towards global security and the democratisation of international relations. Altogether, Lula truly deserves the Nobel Prize for his contributions towards peace and growth, as well as those towards peace and international security. 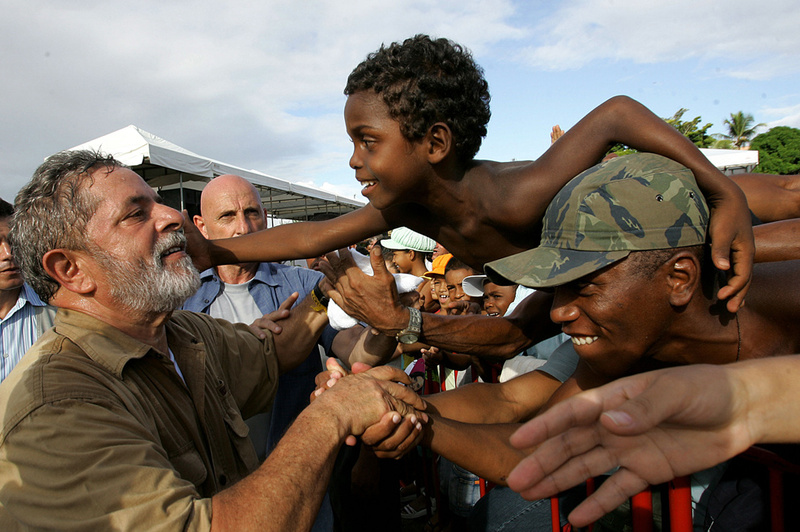 A migrant, Lula has used his experiences as a fighting tool for hope. He has rewritten his story and in turn, has highlighted the stories of thousands of Brazilians living below the poverty line today. Anyone who knows Lula knows that poverty has been an influential factor in his work for the Brazilian Labour Party since its early days. Lula’s policies were made up by three main components: Bolsa Familia, minimum wage in value and the introduction of bank credit for housing, small businesses and other basic needs. In this regard, Bolsa Familia stands out. In his letter, Esquivel quotes Lula’s famous words: ” we need to overcome hunger, poverty and social exclusion, our war is not about killing people, it’s about saving them”. That was the message sent by Lula that became a mantra in all International Institutions, from the United Nations to the Economic Forum, Davos and the WTO. Ex president Lula’s conviction, talent and self confidence lead to what the UN considers as ” one of the largest programmes of cash transfer in the world”, reaching 26% of the population in 2012, reducing the poverty line to 8% (since the beginning of the programme in 2009). Additionally, the programme made a positive impact on school enrolments and a reduction on the Gini. The programme was so successful that it resulted in Brazil being removed from the Hunger Map in 2014, as published by the FAO ( Food and Agriculture Organisation). Together with the Bolsa Familia, Lula’s social policies, whether the minimum wage ( which increased by 57% between 2002 and 2010) or the infrastructure programmes and industrial incentives ( especially the growth acceleration programme) helped the country to grow economically in a way that had never been experienced before. The Brazilian GDP was substantial and the country reached a surplus above 30 billion dollars a year after suffering a deficit of 1.1 billion dollars during Fernando Henrique Cardoso’ s government. If growth is Conditio sine qua non to achieve peace, Lula, perhaps has been the greatest leader since the Second World War. The truth is Lula managed to establish internationally acclaimed rights. Those human rights were expressed in the international arena through declarations and treatises by UN, especially, the Universal Declaration of Human Rights, the International Covenant on Civil and Political Rights and the International Covenant on Economic, social and Cultural Rights. Despite Brazil being one of the largest economies in the world, it was only during Lula’s government that the country was internationally recognised for its potential and role in the Global search for peace and democracy. Lula’s credibility can be witnessed in situations such as when Barak Obama, then the president of the most powerful country in the world, called him: “o cara”. The Brazilian Foreign Minister Celso Amorim, was also considered to be the ” World’s Best Chancellor” by the prestigious Policy Magazine. Brazil contributed towards the democratisation of International relations in various aspects. At the UN, for example, Brazil joined Germany, Japan and India proposing a reform to the Security Council in order to consider new permanent members that should come from underdeveloped countries. Yet, in the build up of an agenda for peace in International relations, UNASUL and ZOPACAS joined efforts for a more pacific world. ZOPACA was created in 1986 but it was only during Lula’s government that the Forum became more organised. UNASUL was created in 2008 with the leadership and remarkable support from Brazil. Lula showed the world that when the concern is cooperation between communities, well being awareness and regional alliances for peace, the ideological background of governments do not matter and it is necessary to transcend our differences on behalf of a common ground. UNASUL innovated juridically and practically, in all aspects and mechanisms of integration as never seen before in the American Continent. In its treatise UNASUL aims for the creation of a ” sul- american citizenship” looking for a “culture of peace in a world free from nuclear weapons and weapons of mass destruction” ( this being one of Alfred Nobel worries when he created the Nobel Prize). From an operational perspective, it was UNASUL Defense Council ( and other council bodies) that acted on behalf of a pacific solution Bolivia’s destabilisation (Pando’sarea) in 2008, and in Colombia and Venezuela (2010), in Ecuador (in the National Policy uprising in 2010) and in Paraguay ( with the president Fernando Lugo’s deposition in 2012), as well as promoting prompt cooperation to the Haiti earthquake in 2010. The creation of BRICS, its Bank for Development ( which overcame paragons with its vertical collaboration) and the Forum IBAS are some of the other accomplishments where Brazil has had a noticeable role. The building up of a more equal world, democratic in its international relations, with a proper care for those in need and development, without doubt were indelible marks from this migrant from Brazil’s Northeast, a metallurgist, ex-president of the Federative Republic of Brazil and a great citizen of the world. We recognise Lula as a great world leader, one of those that come around occasionally. The Nobel Prize is a recognition of his greatness. The Nobel Prize would represent the people’s fight in search for growth, a more just and egalitarian society and a more secure and internationally democratic world. Carlos Enrique Ferreira is a Political Sciences Doctor by the Universidade de São Paulo a postgraduate in Philosophy by the same university. He is, also, a professor of International Relations by the Universidade Estadual da Paraíba, a member of Reflection in International Relations Group and, currently, is a councillor for the Conselho Estadual de Educação da Paraíba.